DigitalStakeout Scout data enrichment improve security models, enable untapped workflows and alerts, and increase situational awareness in the security operations center (SOC) with new insights. With thousands to millions of posts being generated that are attributable to your organization, it takes precision technology to illuminate security context surrounding your data. DigitalStakeout Scout enrichment provides the necessary context to focus on relevant items that indicate a security threat, create vulnerability, weaken security posture or violate security policy & compliance requirements. Data that once lacked credibility or did not have enough information to be used in the SOC now can become a valuable asset in your arsenal to mitigate risk. Automated enrichment enables analysts to spot non-obvious attributes in raw data providing important perspective and meaning in a security context. Every piece of content processed by Scout monitors is enriched in real-time, providing meta-data in an instant to acquire security context. Enrichments are stored as fields and they provide new insights into your data. Security enrichment enable threat detection, alerting and analysis use cases that are not possible otherwise. Powered by machine learning technology, on average analysts save 80% of their time with the benefit of DigitalStakeout Scout‘s automated enrichment. 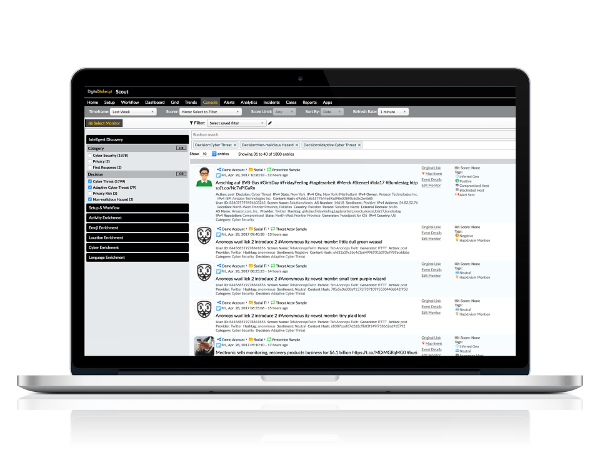 A full stack of enrichment capabilities solve questions in real-time so you can detect threats faster, triage incidents efficiently and mitigate risk faster. Every data source Scout processes has a unique set of fields. DigitalStakeout normalizes each data record and maximizes extractions into common fields making filtering and triage 80% faster for analysts. Leveraging a frequently updated corpus of 500+ classes and 2,500+ properties, Scout automatically identifies over 5 million people, places and things mentioned in content. Scout automatically classifies data into 20+ cyber security, physical security, operational security and other risk relevant topics. Topic classification delivers real-time detection against targeted and advanced threats. Classifiers are updated daily to according to DigitalStakeout researchers and customer feedback. Geotagging and geoparsing link geographic context to data. Scout extracts location and place name from unstructured text & fields to enrich records with physical and network geographic entities. Scout workflow rules engine support user-defined data tagging. With access to 50+ entity fields, boolean filters and complex event queries, Scout can enrich a record exactly to a set of conditions established by an end-user.